Online Private sessions are convenient! Learn an individualized yoga, meditation, breathing, and/or de-stressing practice in the privacy of your own home 1:1 with internationally known yoga teacher, Bobbi Misiti. We use FaceTime or Zoom video conferencing for our online sessions. The online private session can be for yoga, health coaching, nutrition, aromatherapy / essential oils, lifestyle, questions for advice on musculoskeletal conditons, and grass roots home remedies using oils, herbs, and foods. By appointment only. Please contact Bobbi at bobbi@befitbodymind.org or 717/443-1119 to schedule an appointment. Mahalo. One on one guidance can be one time, for a short time, or ongoing. You will get individualized assistance with any questions you have about health, wellness, nutrition, and yoga. For yoga 1:1, you will get assistance in each posture with careful attention to breathing, form, and individualizing the practice to your needs. 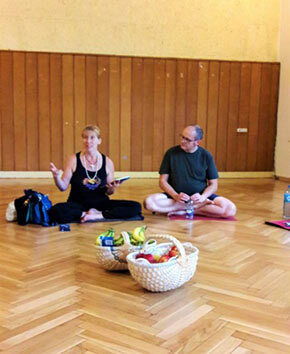 Sessions can be a therapeutic practice, Ashtanga practice (primary, second, or third series) or focused on a certain area (such as breathing, stress techniques, or learning something new) depending on your wants and needs. This is a beneficial way to safely learn the ancient form of Yoga. Private sessions can also include nutrition, wellness coaching, questions for advice on aches, pains, illnesses, injuries, or developing a grass roots home remedy “pharmacy” or better yet farm-acy of essential oils, herbs, and plant medicines. Private session is one individual with one teacher. All private sessions require scheduling in advance.